1. Bring milk, cream, and vanilla beans (and the scraped seeds) to a boil. Remove from heat and let infuse for an hour. 2. Whisk together yolks and 170 g honey until thick and ribbon-like. 3. In a saucepan, bring the cream and milk mixture back to a boil. 4. While whisking constantly, pour half of the cream/milk into the egg yolk and honey mixture. 5. Pour this mixture back into the saucepan with the remaining cream/milk. 6. Over medium heat, cook the sauce while stirring constantly with a wooden spoon or silicon spatula. Cook until the sauce thickens and reaches 185� F (85� C). 7. Immediately pour through a fine strainer. Chill the ice cream mixture in ice water until completely cold. 8. When the mixture is cold, pour into an ice cream machine and churn until frozen to a soft ice cream consistency. 9. Remove from the ice cream maker and place in a previously frozen container. Cover well and store in a freezer until needed. 1. Melt chocolate in a small bowl over simmering water. When melted, pour into a zip lock bag. Cut the corner off the bag to make a small opening. 2. Line a cookie sheet with parchment paper. Carefully make a heart shape with the chocolate from the bag. Fill in the center of the heart with more melted chocolate from the bag until it is completely filled in. Place in refrigerator until needed. 3. To make the sundae, fill a sundae bowl with a couple scoops of honey ice cream. 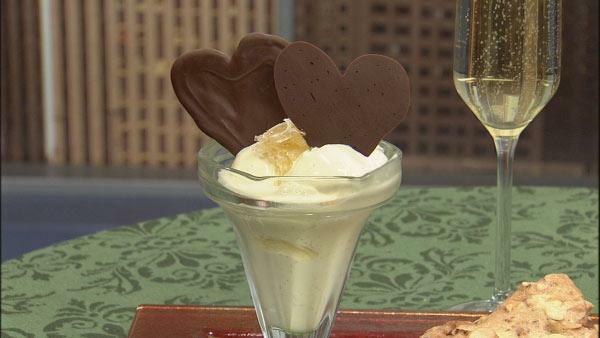 Top with a couple of chocolate hearts and a piece of honey comb. Serve immediately with tuiles on the side.